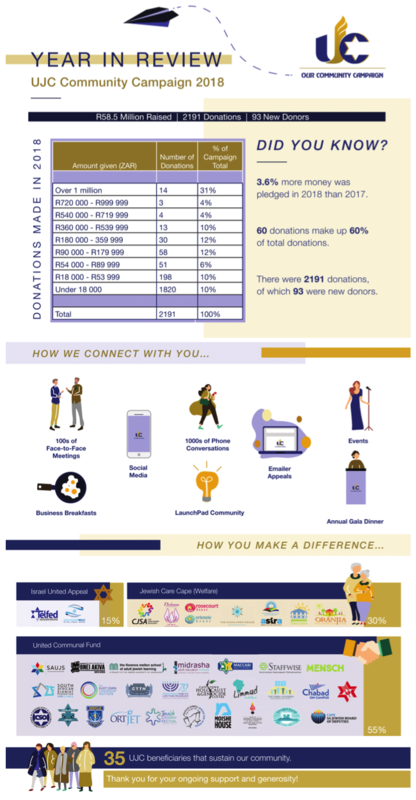 The United Jewish Campaign (UJC) is the Cape Town Jewish Community’s umbrella fundraising body. In many ways, we are the engine room of the community, powering its various organs and maintaining its vitality, viability, and ongoing growth and development. 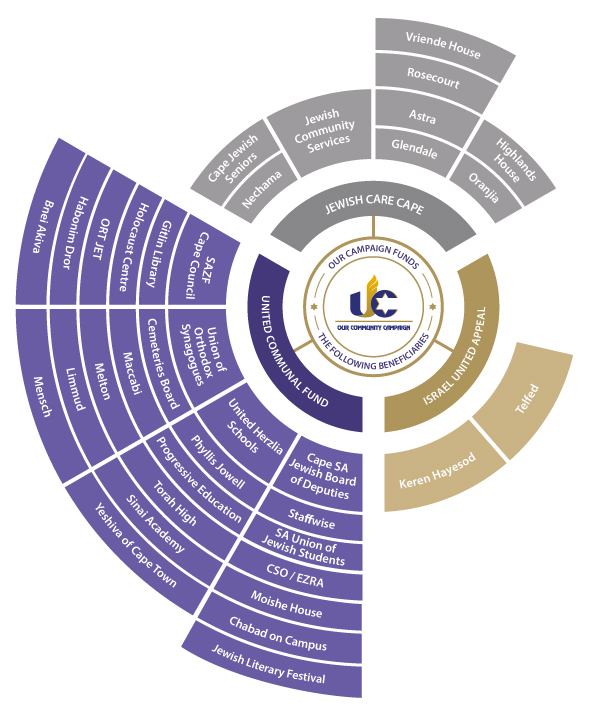 Through various fundraising events, campaigns and initiatives, the UJC sends funding pulsing through the veins of the community, bringing to life the constellation of schools, welfare organisations, and other communal bodies that make the Cape Town community one of the most vibrant in the diaspora. We focus our efforts on 3 distinct branches: Community, Welfare, and Israel. 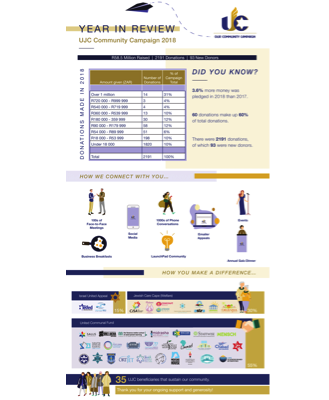 Our largest branch – United Communal Fund – covers the day-to-day running and upkeep of our community, from religious institutions to communal bodies, education to health and safety, personal empowerment to social action. 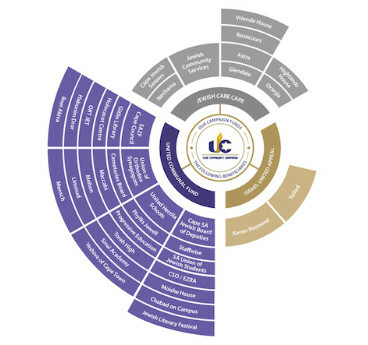 The second branch – Jewish Care Cape – ensures that our most vulnerable are protected and empowered. We care for the sick, we house the homeless, we feed the hungry, we support the bereaved, and we ensure dignity for all. The third branch – Israel United Appeal – maintains our deep connection to the state of Israel, supporting South African immigrants, and Israel’s outreach work around the world. We are fundraisers, first and foremost, financially maintaining the community’s proud network of schools, welfare organisations, and other communal bodies; the UJC operates an annual fundraising campaign from which it allocates the proceeds to the affiliated beneficiary organisations. But we believe that in order to create a culture of sustainability, we need to be part of educating and inspiring the community as well. We run events that inspire. From business breakfasts to our Girls’ Night Out. We celebrate talent. From music festivals to art exhibitions. We empower change-makers and future leaders. We recognise the importance of future generations, through various programmes, such as LaunchPad. 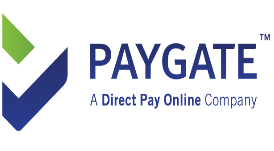 We are the financial heartbeat of the community. We don’t just fundraise, we ensure the continuation of our community in all its diverse and complex beauty. In order to give, you need to believe in what you’re giving to; it’s important for us to share our vision for the year and our philosophy for the future. Ensuring the wellbeing, development and sustainability of the Cape Town Jewish community.